Students will watch the video of FDR's Four Freedoms Speech. 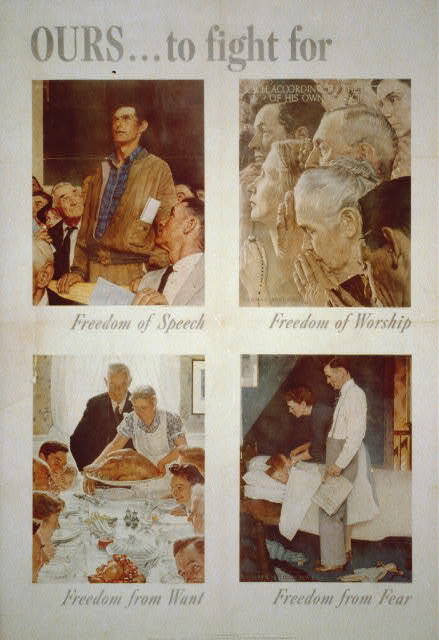 Then look over the visual interpretation of these freedoms by artist Norman Rockwell. (Both found below.) Next, use the worksheet below to brainstorm and formulate your own "Freedoms." Lastly, you must express your four freedoms by using any of the following mediums:Monologue, Newscast, Collage, Comic Strip, 3-D Item, PowerPoint, Photostory or MovieMaker. Choose the medium that works best for you; they are all worth the same amount of points. Your creative Freedom piece and worksheet are due at class time Monday. Students are to complete the assignment listed below and turn them in on or before Monday, April 13th. Each should be completed outside of normal class time and is due Monday. Completion of these assignments equals a "Present" mark for our make up day and a grade in the grade book. Failure to complete the assignments equals an "Unexcused Absence" that counts toward your 10 maximum absences and a zero for the assignments. Assignments should be submitted electronically either through the Assignment Dropbox on this Weebly page or shared/emailed through Google. I am available after school daily for assistance.